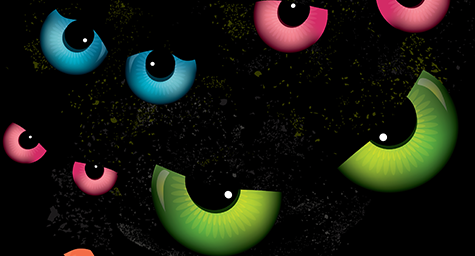 It’s that that boo-tiful week of the year when social media marketers spring their most spine-chilling Halloween posts—and ghastly wordplays—on unsuspecting consumers. Amazon has a wealth of spooky products for sale, and it’s doing an excellent job of showcasing many of them in creative ways on social media. For example, this creeptacular T-shirt truly shines in a Vine video. 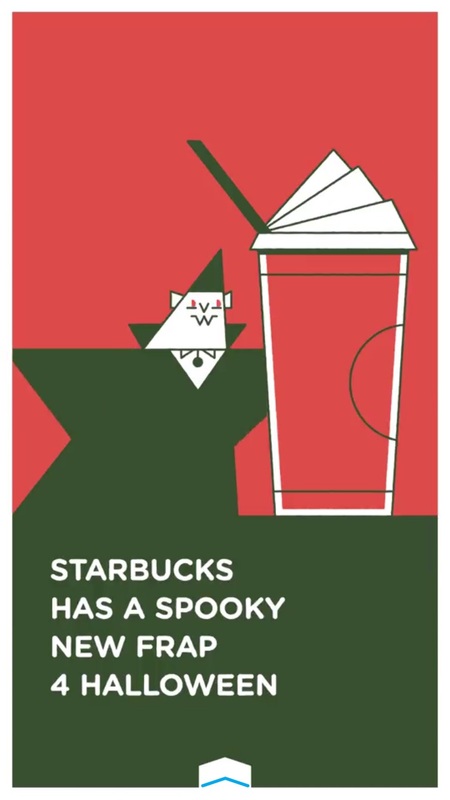 To advertise its special Halloween Frappuccino, the coffee chain has been running a clever—and surprisingly cute—animation across Snapchat Stories, featuring a thirsty vampire. Star Wars characters are set to be a big hit this Halloween, and probably for many years to come. Still, Disney/Lucasfilm isn’t resting on its laurels; the brand is flooding social media with costume tips that smartly double as movie teasers. Instead of showcasing fake gore, the Mayo Clinic has taken a novel approach to Halloween: it’s trying to prevent real-life accidents. 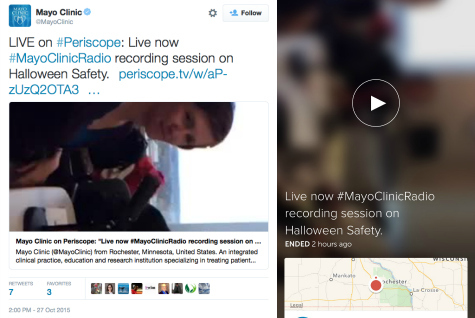 The hospital’s experts have been streaming on Periscope to highlight common mishaps—and how to avoid them. Why should you paint your Halloween pumpkin teal this year? Healthline has a surprisingly good answer. Home Depot gathered a group of style bloggers and let them have their way decorating their homes with products from the stores. The resulting Style Challenge posts, which can be found on Pinterest and other networks, are truly terror-ific. The Tower of London has a couple of great things going for it on Halloween: a historical landmark with lots of haunting history and talented guides who know how to tell a good story. 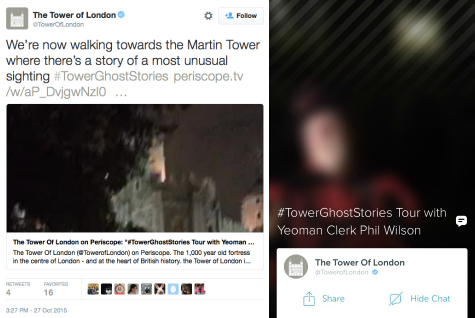 Its recent Periscope livestream, which featured a yeoman clerk narrating a ghost story tour, brought these two together brilliantly. The most haunting post you may see this Halloween comes from a very unexpected source: The National Oceanic and Atmospheric Administration. Does Seattle have a haunted soda machine? Judge for yourself after checking out this spooky little story from Coca-Cola. What’s scarier than a fake skull? A real skull! The New York Public Library gets in the spirit of things with a haunting image of Percy Shelley’s bone fragments. Who says Halloween can’t be educational? The National Zoo is using it as an opportunity to inform people about all sorts of animals, including this hornbill who’s searching for a treat inside a pumpkin. According to Cap’n Crunch, three out of four monsters say the cereal is delicious. The polling methods are a bit dubious, but the posts are perfect. Finally, a reminder that Halloween posts don’t always have to be gory or shocking to connect with audiences; sometimes it’s perfectly fine to just be in the spirit of the season. 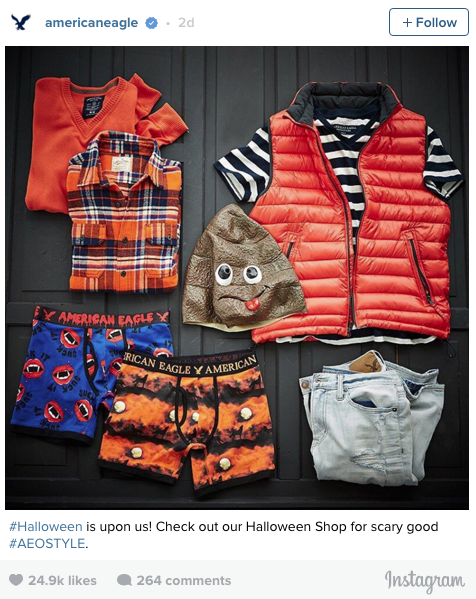 This Instagram post from American Eagle has 10,000+ likes already, despite there being nary a drop of blood. See how social media marketing can engage consumers. Contact MDG Advertising today at 561-338-7797 or visit mdgadvertising.com.